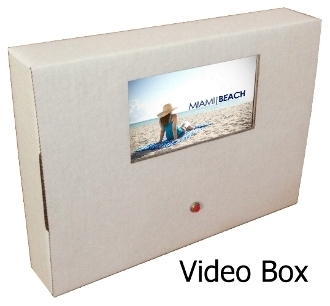 7" Commercial Grade LCD Display with Video Processor mounted inside Cardboard Box. Push Button mounted on front. 8 "D" Cell Battery Packs mounted inside Video Box. Batteries are not included. Designed for One (1) minute Video Advertisement or less. Push button and system will play one minute of video and automatically shut off to conserve battery power. Tested to run over 3 weeks with at least 40 activations each day (Reaching nearly 1,000 customers before batteries need to be changed). IMPORTANT: Lead time is 2 to 3 weeks if we run out of current inventory.